Looking for a dark pink powder blush? Read on.. When applied with a light hand, both really gives me a flushed look. The NYX blush isn't powdery and staying power is as good as MAC. Warning! Both are really pigmented. You only need to TAP your brush once or twice. Make sure to apply with a stippling blush or a kabuki brush, or you'll end up looking like a clown. 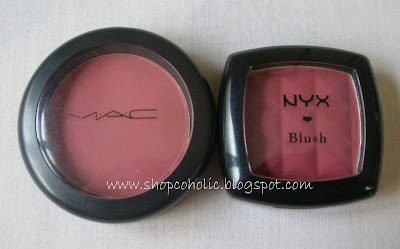 As you can see, NYX's blush is more pink, while MAC is pinky brown. When applied to my cheeks, I really can't tell the difference between the two. 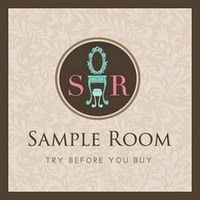 that is very true..almost the same quality for a much cheaper price..thanks for the color idea! I know! this is super pigmented!!!! Hey, this is good to know. 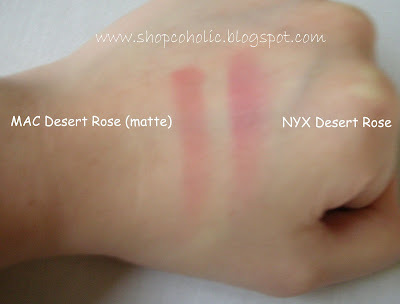 Im gonna look into that NYX blush :) Thanks for this post! great comparison! Where can I buy kaya nyx products here? oh wow de luk very similar! oh.. i wish i can buy NYX blush in white gold. ..
very good review, practical and objective!! hi there,do u know where we could buy nyx cosmetics hr in the phili?